How can you make the school gym more exciting? Get your students climbing the walls – literally! – with these fantastic rock climbing walls. At Hertz Furniture, you'll find everything you need to set up indoor rock climbing in your school. With our safe and colorful collection, you can find the right fit for any space. 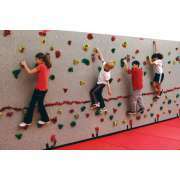 We offer climbing walls in a variety of lengths and heights. Is the standard package too small for your wall? No problem – we have extensions that can accommodate any wall length. Check out beautiful scenic murals for additional visual excitement. So get ready, get set – and climb. What are some new ideas for gym class? One of Hertz Furniture's goals has always been to keep up with – and even ahead of – educational trends. We strive to provide today's schools with highly up-to-date, cutting-edge furniture and equipment so that schools have the tools they need to empower both students and teachers. If you are looking for a modern way to spice up your physical education program, a rock climbing gym is just what you need. Why are kids rock climbing walls so popular? Rock climbing walls are becoming increasingly popular in the "new PE" that seeks to use physical education classes as a way to get all students up and moving. In the past, those who were good at sports dominated while others were reluctant to play. As childhood obesity rates continue to rise, today's gym teachers realize that physical activity is crucial for the health of all children. In order to give all students a healthy dose of physical activity, they need to offer more than just a ball with a bat or goal. P.E. classes can be an important tool for promoting social-emotional intelligence, problem-solving, spatial relations and much more. A rock climbing wall is sure to entice students and promote many of the critical skills they need as they move forward in life. 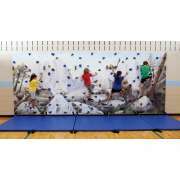 What kinds of climbing walls can go in a school gym? 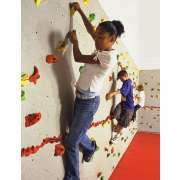 Traverse-style rock climbing walls take the fun and challenge of rock climbing and turn it sideways. Not all children are capable of climbing upwards - some are afraid of heights, others lack the coordination and for younger children it is simply unsafe. Traverse Walls let everyone participate by making the challenge lateral as well as vertical. The idea is to climb across the wall, not necessarily up. This lets everyone - including special needs children – join in the fun. What kinds of activities can you do with a rock climbing wall? One of the best things about climbing walls is that they're dynamic. Basketball will always be basketball. Baseball will always be baseball. But climbing walls don't ever have to be the same twice. You can change them as often as you like, so students can always enjoy new challenges. While the height and length of a kids rock climbing wall remain the same, the positions and placement of the handholds can change as often as you like. They can be close together or far apart, positioned in a specific pattern or free-form - whichever you decide is best for the class you're working with. Rock-climbing walls can be used as an organized sport with rules and regulations, or as a free-play game in which each child climbs the way he or she likes. They can be utilized to teach teamwork or how to work cooperatively in pairs, with or without competition. Kids rock walls can also be used to enhance skills learned in other classes such as map skills, directions, spatial orientation, color recognition and more. Why should I invest in a rock climbing wall? It is often challenging to get the whole class involved in physical activity together. There will always be students who just don’t like sports and prefer to watch from the sidelines. Given the prevalence of childhood obesity and other health problems, having equipment that will get all students excited about PE can really make a difference. Often the students who are the least excited about participating in physical activity are the ones who need it the most. There are many ways in which Physical Education benefits students. For this reason, it is important to make sure that everyone participates, and getting a rock wall is a great way to entice students who are usually less than thrilled to take part in gym class. It's easy to see why rock climbing walls have become so popular in today's schools. So why aren't all schools running to purchase them? You got it – everyone's favorite word: school budgets. While grants are available, they are not easy to get. If you feel your school would benefit from integrating rock climbing walls into the physical education program, Hertz Furniture's financing departmentwill be happy to assist you in developing a plan that suits your needs. Our team will be with you every step of the way from order to installation so you can rest assured that your students will be getting the best tomorrow's education has to offer – today.